FFMPEG is a cross platform framework used to perform a wide range of operations on audio and video files. It can record, stream or convert any kind of audio and video files flawlessly. FFMPEG framework comes with a vast variety of builtin tools that makes audio/video operations easy. Almost all popular streaming services use FFMPEG on the backend to fulfill their required tasks. FFMPEG is purely a command line tool and your should have proficient knowledge of command line to use this tool. WinFF is a graphical User Interface for FFMPEG, now you can perform your FFMPEG related operations using an easy to use graphical interface and mouse clicks. This tool may prove to be a blessing for normal desktop users, although software developers still have to use command line FFMPEG to code their applications, but testers or normal desktop users can test and run their FFMPEG related tasks with great ease now. 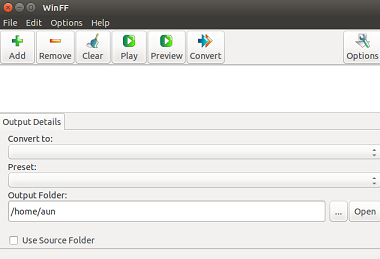 In order to install WinFF On Ubuntu Linux operating system, we need to add its PPA to our package manager first. Launch your system terminal and run following command to add its Package information to APT. Congratulations, WinFF has been installed now. You can launch it from Applications menu, if you are unable to locate it there, run following command to launch it. Start using this wonderful tool. WinFF is a lightweight, stable application; even if you don’t have much technical knowledge of FFMPEG, you can still benefit from it by using this utility. Its equally popular among users of Linux, Microsoft Windows and Mac OS. Hope you enjoyed this article, do let us know in comments please.